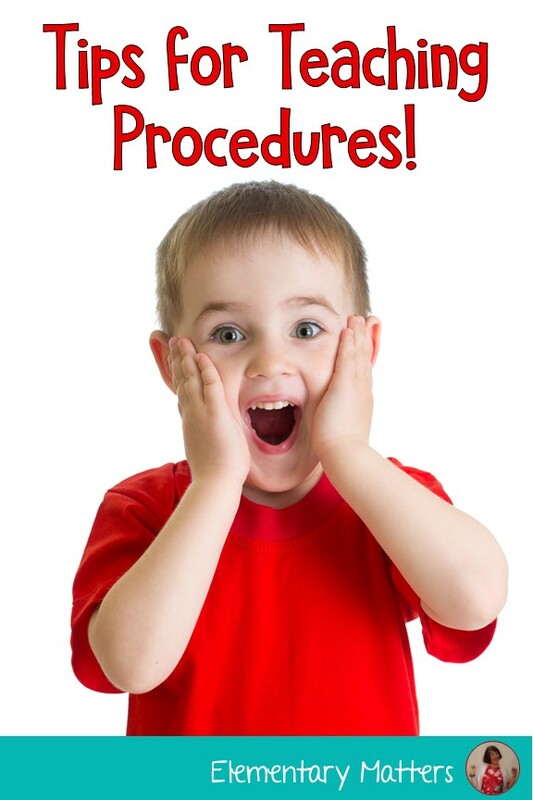 The beginning of the school year is all about procedures. The kiddos learn procedures for lining up, choosing books, signing out to the Library, how to pass in work, what to do when work is finished. We teach them the procedure for fire drills, procedures for lock down, procedures for evacuation drills. We teach them the procedure for going to lunch, going to recess, and going to Phys. Ed. class. We teach them the procedure for reading groups, playing learning games, math time, and using materials in the classroom. 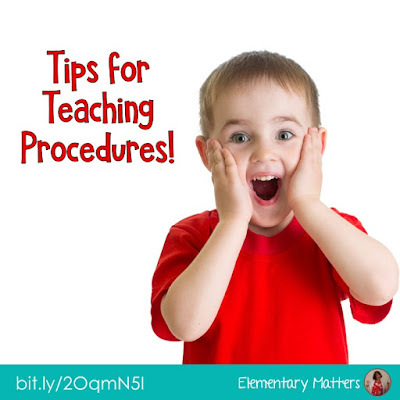 Here are some things to think about when teaching procedures! Isn't it amazing how they'll always notice what's done wrong when the adult is doing it? And they're not shy about pointing out what I did wrong! Once they've had a good discussion on what NOT to do, it's time to have someone model what to do. Have a few volunteers act out the right thing to do. Be sure to comment on each thing the child does right! This is a good chance to give positive attention to some of those kids who REALLY need attention! "Notice how John pushed in the chair as he walked by." "I like the way Bobby walks at a good pace." "Did you notice how Marie let Anna go first?" "I noticed Bradley kept his arms by his sides when he was walking." "Of course Theresa put her math tools away properly before walking to the line." After having several children acting out the right way for the procedure, it's not over. Find time later in the day for more children to model it again. Every time they go through that procedure for the next couple of days, have them stop and think about what they've learned. "Before we line up, turn and tell your partner what we've learned about the right way to line up." "Close your eyes and picture yourself lining up the way we practiced." "After you share with a partner, take a deep breath before you line up." "Put your hands on your head if you know the right way to line up." "Name something your partner won't think of that's important to remember when lining up." You know, it's amazing we ever finish going over the procedures and get on to the real learning! But seriously, if you take the time to teach the procedures properly, the rest of the year goes smoothly. And I truly believe that's worth it! Thanks for the reminders. It truly makes a difference when we model the wrong way and the right way. Procedures are everything . . . all year long.